Perfect time to become an existentialist, Fawn. In this context (and probably no other context) the answer “You are real. You’re just actually a tiny magical pixy” would make the most sense. Agreed, but not fully. 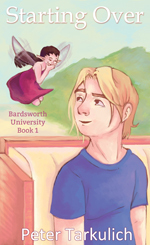 She may have most of the memories Mike knows Fawn has, but the fairy doesn’t know she is freaking about being a dream fragment. I just realized that Kris must have been talking for hours! LOLOLOLOL!